Pope Francis has maintained remarkably high public approval ratings in the United States throughout his papacy. But many warned during the months leading up to his American visit in late September that his continued focus on controversial policy issues might cause those support levels to plunge from their rather celestial heights. Could his continued emphasis on issues such as climate change actually turn people off, generating a backlash against the Pope and any serious engagement on the issue? Our sampling of public opinion during the weeks leading up to his visit and the first days after his arrival in Washington, D.C. suggest that Americans generally resonate with the Pope on climate change. The latest results of the National Surveys on Energy and Environment (NSEE) from the University of Michigan and Muhlenberg College indicate that majorities of Americans support Pope Francis’ call to action on climate change. Moreover, there is further evidence that the pope has had some impact in convincing Americans that global warming is real and warrants a public response. And, if anything, it appears that the Pope’s engagement on this issue has only served to bolster his own base of public support within the United States. These findings coincide with a significant jump in our latest survey in American belief that there is solid evidence of warming global temperatures. Many factors appear to contribute to this, including the growing effect of severe droughts in regions of the United States. But the “Francis effect” should not be overlooked as at least a partial contributor to growing acceptance of global warming among Americans. This will be further discussed in a report from University of Michigan due out next week on the connection between religious belief and attitudes about global warming. Our data finds that 60% of Americans say they support the Pope’s call to action to address climate change. 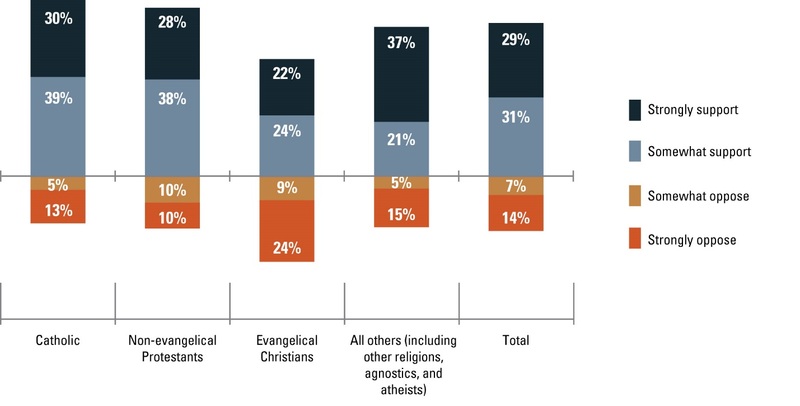 This support is strongest among Catholics (69%) and non-evangelical Christians (66%), but even a plurality (46%) of evangelical Christians who have traditionally been most doubtful of the existence of global warming also support the Papal call-to-action (see Figure 1). Looking at the 21% of Americans who oppose Pope Francis’ encyclical, this group includes roughly even numbers of those who doubt the existence of climate change, as well as those who believe in global warming but do not think religious leaders should discuss environmental issues. NOTE: “Not sure” responses are not shown. Further, we find that Pope Francis’ encyclical appears to have had a slight impact on both Americans’ belief in climate change and opinions of the Pontiff himself. 15% of Americans say they are more convinced that global warming is happening and we should act as a result of the Pope’s encyclical. This increase in belief in global warming is true among Americans of all creeds (see Figure 2). NOTE: “No Impact” and “Not sure” responses are not shown. Though Americans are largely split on whether or not religious leaders should discuss environmental issues within the context of their faith (49% support, 42% oppose), over a quarter (27%) of Americans say that their opinion of the Pope has improved as a result of the Pope’s call for action on climate change, while only 6% say their opinion has worsened. The needle has moved most significantly among American Catholics, 36% of whom say that their opinion of the Pontiff has improved (see Figure 3). But even non-Catholics are more likely to say their approval of the Holy Father has improved rather than worsened as a result of his encyclical. NOTE: “No Change” and “Not sure” responses are not shown. This survey offers only a single snap shot from a very salient period in the life of this papacy, namely the weeks leading up to Francis’ arrival in Washington, D.C. and the first two days of his visit. There was substantial media attention to Francis throughout this period, including much exploration of his views on climate change. So it is impossible to know what lasting effects his visit will have, particularly over coming months and years. But our findings suggest that his message appears to resonate broadly with diverse subgroups of the American population and may have had some impact on how Americans understand climate change and consider possible responses.